Maurice „Prof“ O’Connell is a man of many talents who can be found helming an Offshore Race Boat in the RORC Caribbean 600 or sailing a Mirror Dinghy in Cork Harbor with his children. “Prof” as he is best known these days started sailing with his father back in 1976 on his Achilles 24. 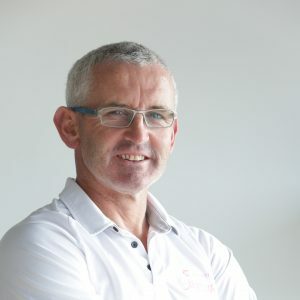 The Sailing bug bit early in the O’Connell House hold and he quickly moved onto Dinghies at Monkstown Bay Sailing Club during 1979 and sailed Mirrors, Vagabonds, Albacores, and Lasers over the following years including winning the Irish Junior Laser Championships 1987. During the 1980’s he also raced keelboats in Royal Cork and Kinsale Yacht Clubs and had the opportunity to race on the famous „Moonduster“ with Denis Doyle. His early sailing was in a variety of different boats and that helped him to become the superb all round sailor he is today. Prof has created a name for himself, being the National 18 Champion with Anthony O’Leary on “Spindoctor”. He has also dabbled in the B14 Skiff class and attended the Star Class events as a coach at the Olympic games in Athens in 2004, and also began his own Olympic campaign and competed in the Star class up until 2008. Prof won three European titles and two Irish National titles in the 1720 Class. Prof was also the RTE TV Analyst for 2008, 2012 & 2016 Olympic Games. Prof always had an interest in sails and sailmaking having worked with the local loft on some projects in Cork. When the Star sailing came to an end he didn’t really like the idea of heading back in the corporate world of work and under the foredeck of an International Dragon in Dublin Bay a plan was hatched to join North Sails Ireland in September 2007. Since joining Nigel Young in NSI in 2007, Prof has been fortunate to have worked with many outstanding racing and cruising clients inc. Conor Phelan on Ker 37 „Jump Juice“, Eamon Rohan on Corby 37 „Blondie III“ & King 40 „Blondie IV“, Stephen O’Flaherty Spirit 54 „Soufriere“, a whole host of great DBSC clients, the 2011 – 2016 partnership with Conor Clarke leading to a Melges 24 Worlds win in 2016. Other highlights for the Prof are that he has competed in RORC Fastnet, RORC Sydney to Hobart, and RORC Caribbean 600 races. He was the UK IRC National Champion in 2008 and 2013. He was the overall Winner in 2009 in the Dun Laoghaire to Dingle race. He took 1st place in the Commodore’s Cup in 2010 and 2014, was he class winner in the Round the Ireland race in 2016 and followed that up with the overall win at the 2016 Melges 24 World Championship in Miami, FL.